Big Data Masters Program to professionals who seek to dependant on their knowledge in the field of Big Data. It makes you proficient in tools and systems used by Big Data experts. 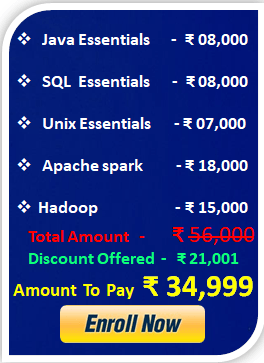 It includes training on Hadoop and Spark, Java Essentials, and SQL. The program is customized based on current industry standards that comprise of major sub-modules as a part of the training process. This program is designed by the industry experts to provide hands-on training with tools that are used to speed up the training process. This program follows a set structure with 4 core courses. It makes you an expert in key technologies related to Big Data. At the end of each core course, you will be working on a real-time project to gain hands-on expertise. By the end of the program, you will be ready for seasoned Big Data job roles. Software Professionals working in outdated technologies, JAVA Professionals, Analytics Professionals, ETL Professionals, Data warehousing Professionals, Testing Professionals, Project Managers can undergo our Hadoop training in Chennai and make a career shift. Our Big Data Master Training will give hands-on experience to you to meet the demands of industry needs. Training will cover java architecture and make you expert in developing the code with various data types, conditions, and loops.It will also cover memory management is handled in java and help you create a java project in Eclipse and execute it. Our SQL Training aims to teach beginners how to use the SQL in RDBMS. SQL Training provided by real-time corporate experts. SQL Training by top industry professionals and standards are certified by Oracle Corporation. Learn how to use Hadoop from beginner level to advanced techniques which are taught by experienced working professionals. With our Hadoop Training, you’ll learn concepts in expert level with practical manner. Apache Spark is created for in-memory computing for lightning speed processing of applications. Apache Spark is basically a processing engine built with the objective of quicker processing, ease of use and better analytics. 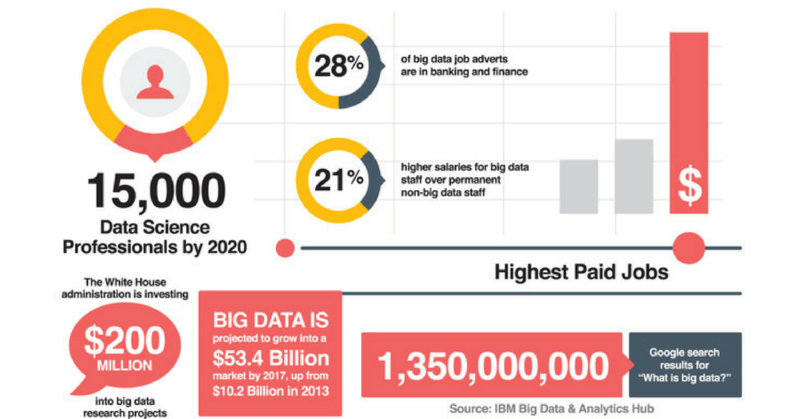 A survey from FastCompany reveals that for every 100 open Big Data jobs, there are only two qualified candidates. Are you ready for the Shift? Big Data Analytics job has become a trending one currently and it is believed to have a great scope in future as well. There is a survey which states Big Data Management and Analytics job opportunities has been increased in 2017 when compared to the past 2 years. What is Besant Technologies Masters Program ? Masters Program is a structured learning path recommended by leading industry experts and ensures that you transform into an expert Big Data Master.Being a Big Data Expert requires you to be a master of multitude skills, and this program aims at providing you an in-depth knowledge of the entire Big Data Ecosystem. How is it different from the individual courses offered by Besant Technologies? Individual courses at Besant Technologies focus on specialization in one or two specific skills, however, if you intend to become a master in Big Data, then this is the path for you to follow. What are the Topics covered as a part of the curriculum? Our commitment to equip you with a 360-degree understanding of the Big Data means we cover a broad array of topics to ensure you build the best foundation for success, which includes: Java Essentials Hadoop, Spark, and SQL many more. The recommended duration to complete this program is 60hours, however, it is up to the individual to complete this program as per their own pace. Will I be receiving the certificate for individual courses also? Yes, We would be providing you with the certificate of completion for every course that is a part of the learning pathway, once you have successfully submitted the final assessment and it has been verified by our subject matter experts.